The horse's hock, or tibio-tarsal joint has, like other equine limb joints, a capsule containing the joint fluid. If the pressure within this hock joint increases due to inflammation the joint capsule will bulge out of the surface of the hock causing a "Bog Spavin". Unlike a Bone Spavin a bog spavin will appear soft and fluctuating and usually appear on the inner front part of the horse or pony's hock. Manipulation will confirm that these soft swellings on the horse's hock are part of the joint itself. Firm pressure on the swelling will result in the fluid being pushed back into the joint and then out again at a different point - usually on the outside rear part of the horse's hock. Bog Spavins are normally only a cosmetic problem but can sometimes cause a horse to go lame. Bog Spavins tend to appear in horses and ponies with weak hock conformation and may come and go with exercise. However a bog spavin can be a sign that a horse has a joint disease. In horses younger than three years old most cases of equine bog spavin are caused by a defect in the tibiotarsal joint. In younger horses the appearance of a bog spavin may cause lameness or stiffness. This should be investigated as the problem may be caused by Osteochondritis. 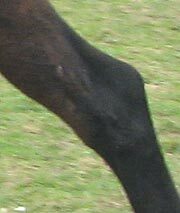 This is a condition of fast growing horses which can also affect other joints. A bog spavinshould not be treated lightly, and it is best if a vet examines the horse to determine the cause, even if the horse does not appear lame. A vet will normally x-ray the horse's hocks to check for any bony changes as it is important to address the underlying cause of the joint swelling. If the horse's hock conformation is basically good a veterinary surgeon may drain the fluid from the swellings through a needle. This will achieve an immediate short term cure for a bog spavin, but unless the underlying cause of the bog spavin is treated the fluid usually returns. Repeated draning is often necessary. Special elasticated bandages with strategically placed pads are available to place pressure on the horse's hock and thus reduce swelling, but even with using these a bog spavin will often reappear.